With one vacation under my belt already this year and the winter semester weeks behind me, I, like most summer-class-free college students, have already fallen into the mood for a few months full of warm weather, sunshine and road trips. I find that my taste in films sometimes mirrors the mindset that I’m in. While not all of these beach films are quite as cheery as I am in my current “no classes until September” bliss, I always find myself gravitating toward films set on beaches or islands during the summer time. Here are five of my favorite classic films, set on or around beaches. 5. 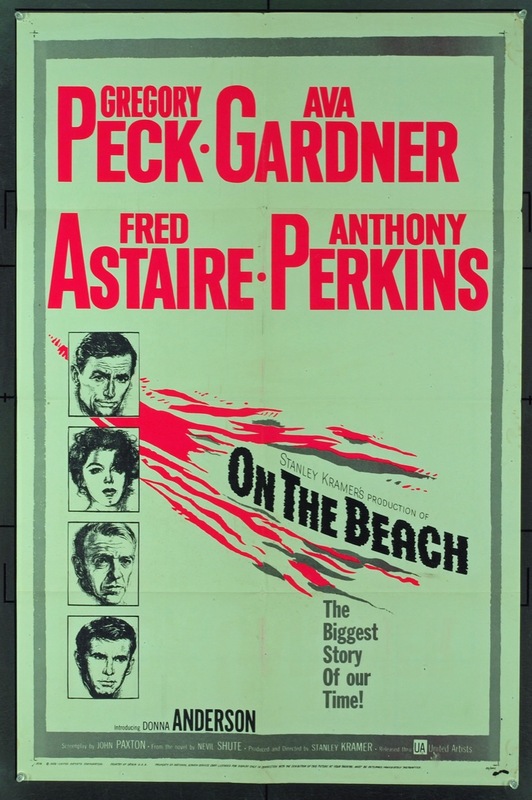 On the Beach (1959) – Gregory Peck and Ava Gardner star as an American captain and the woman who is falling for him. A nuclear war has wiped out all human life in the northern hemisphere. Along with their fellow residents of Australia, the two struggle to accept the fact that life as they know it will soon end. The supporting cast includes Fred Astaire and Tony Perkins. I adore Nevil Shute’s books (particularly cute, pocket-sized General Paperbacks editions!) and this film adaptation of his novel of the same name does not disappoint. The premise is a bit darker than most beach films, but I still had to include it. 4. A Summer Place(1959) – Troy Donahue and Sandra Dee star as two teens who fall for each other while on vacation on an island off the coast of Maine. Summer love is sweet, but drama ensues as the couple’s parents get into romantic trouble of their own and also become determined to keep the young lovers apart. The film is surprisingly intense and emotionally gripping, especially when you go in expecting typical Sandra Dee fluff as I did the first time I saw it. 3. South Pacific (1958) – South Pacific is certainly an aesthetically pleasing film, which is in it self enough reason for it to appear on a list of great beach films. Set on an island in – where else? – the South Pacific, this Rodgers and Hammerstein musical boasts beautiful, tropical sets, shot on location in Hawaii, Spain and Malaysia. But beauty wouldn’t be enough for the film to land fairly high on such a short list. Luckily, the film’s entertainment value matches its eye-catching colors and setting. 2. From Here to Eternity (1953) – It’s simply impossible to make a list about beach films without the iconic beach kiss from this film coming to mind. But beyond that, From Here to Eternity is just a great film, and a true classic. The all-star cast (including Burt Lancaster, Montgomery Clift, Deborah Kerr and Frank Sinatra) is absolutely unbeatable. The script and plot they’re delivering are strong and complex. This eight-time Oscar winner deserves every bit of hype that surrounds it. 1. Gidget (1959) – Gidget may be much fluffier than the rest of the films on this list, but it is also the most fun to watch. Sandra Dee shines in her role of young, surf hungry Francie Lawrence, who becomes known as Gidget – a mix of “girl” and “midget” – by the more experienced surfers at the beach. Francie begins to fall for one of the surfers, known as “Moondoggie,” but soon discovers that both surfing and finding love are more difficult that she anticipated. This is the quintessential sweet, summery film that instantly makes me long for a sand-filled vacation every time I watch it. Haha! Beach party films belong in a whooole separate category. I watched a few of them the year I discovered Gidget in hopes that I would find something as good… needless to say, I didn’t succeed (though some of them would land on a “so bad they’re good” beach films list, if I made one). I think you should make one. I just might do that for next Tuesday’s list. Thanks for the suggestion! Previous Previous post: Through the Library is BACK!